Ken Haller shares his story at The Story Collider podcast event on May 2, 2017. 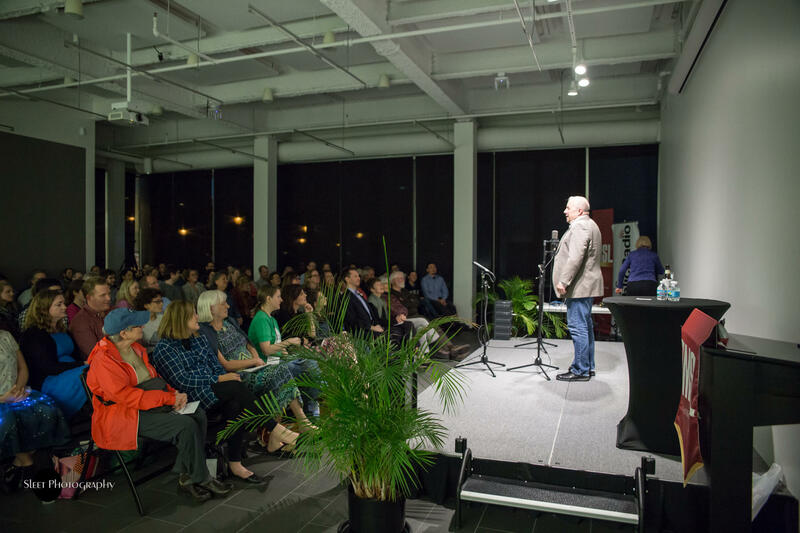 On May 2, St. Louis Public Radio hosted The Story Collider, a national podcast and live storytelling group, for an evening of personal stories about science told on stage under the theme of “Eclipse.” The event was sponsored by the St. Louis Storytelling Festival. Ken Haller, SLUCare pediatrician at SSM Cardinal Glennon Childrens Medical Center and professor of pediatrics at Saint Louis University, shared a personal story from his first years as a doctor in New York City during the rise of the AIDS crisis. Listen to Ken Haller, a St. Louis-based pediatrician, share a personal story about science from the May 2 Story Collider event at St. Louis Public Radio. Since 2010, The Story Collider has collected personal stories about science and shared them in live shows and a weekly podcast. Since the May show in St. Louis, the group has partnered with St. Louis Public Radio to produce future shows here through St. Louis Public Radio reporter Eli Chen. The next event will be during the month of October. Have a science story to share? Reach out to stories@storycollider.org to participate. Dr. Ken Haller, far left, Joan Lipkin and John Schmidt are participating in next week’s Briefs Festival. The trio talked to ‘Cityscape’ host Steve Potter, far right, about the event on Friday at St. Louis Public Radio in St. Louis. What do a gay mermaid looking for love, a Jewish mother who competitively wants her single son to have the biggest wedding, and a lesbian version of Dr. Seuss have in common? They are all themes in this year’s Briefs Festival of Short LGBT Plays, a festival that brings together numerous directors and actors to showcase the work of eight different playwrights under one roof. The eight plays being performed at the festival on March 27-29 at the Centene Center for the Arts have been selected out of more than 170 submissions from across the country. On Friday, “Cityscape” host Steve Potter talked about the festival with Joan Lipkin, the festival’s co-producer and artistic director of That Uppity Theatre Company; Dr. Ken Haller, a pediatrician and actor; and John Schmidt, a playwright and the winner of the Ken Haller Playwriting Competition for LGBTQ and Allied Youth. “Cityscape”: Dr. Ken Haller, Joan Lipkin and John Schmidt preview the Briefs festival. When: 8 p.m. March 27, 2015; 4 and 8 p.m. March 28, 2015; 2 p.m. March 29, 2015; the Ken Haller Award Reception is 6:30 p.m. March 27, 2015. Ken Haller is a pediatrician in his day job. But in his spare time, he is a cabaret singer. Following the success of his previous shows “Side by Side by Sondheim” and “The TV Show,” Haller will celebrate his 60th birthday with “Mama’s Boy,” part of the Gaslight Cabaret Festival series.